This is a post of a cool idea that I put to test but lacking in pretty photos. No matter, it is too cool to just keep to myself. Any British or anglophile baker reading this? Any procrastinators who missed Stir-Up Sunday and still haven’t made your Christmas pudding yet? My answer was an emphatic yes to all of the above as of last night but not anymore! As I mentioned yesterday, I am smitten by Dan Lepard’s new cookbook Short & Sweet. The book has a number of British Christmas pudding recipes including plum pudding and figgy pudding. They all call for steaming the pudding in a traditional 2 pint pudding basin with a lid that you make out of parchment paper, foil, and string. The whole contraption is steamed in a water bath for hours until it is cooked through. Every recipe ends with the dire warning that you should not, under any circumstances, peek inside the lid after the pudding is steamed. 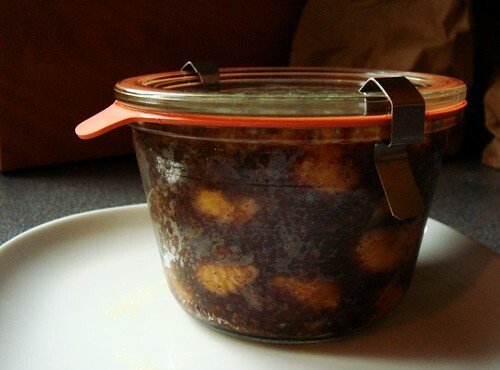 During the month-long aging period, you want to minimize the risk of introducing mould to your pudding as it sits quietly in the dark cupboard. Water bath? A tight seal? Storage at room temperature? Sounds like canning to this home canning aficionado! Indian cuisine is at once familiar and exotic to me. Familiar to my taste buds because Toronto is a multi-cultural city with large South Asian population and authentic Indian food is woven into our dining culture. Exotic in my kitchen because I rarely crave Indian food at home. The whole concept of toasting whole spices and grinding my own spice blend as building blocks for most dishes seems like a job best left to the professionals. 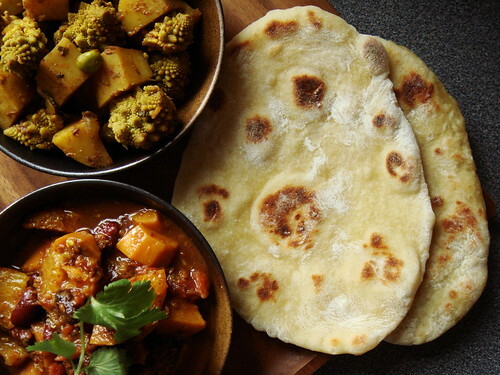 However, there are great reasons to cook Indian food at home. The wonderful choices of vegetarian and vegan dishes fit right in to my way of eating. Besides, I can still enjoy the vibrant flavours of these dishes without the heavy greasy taste often found at restaurants with penchant for ghee. About a week ago I received a new recipe to test for an upcoming issue of Cook’s Illustrated Magazine. The recipe for naan promises fluffy tender restaurant-style flatbread that I can make at home with a non-stick skillet. Of course I jump at the chance to cook an Indian Feast at home. 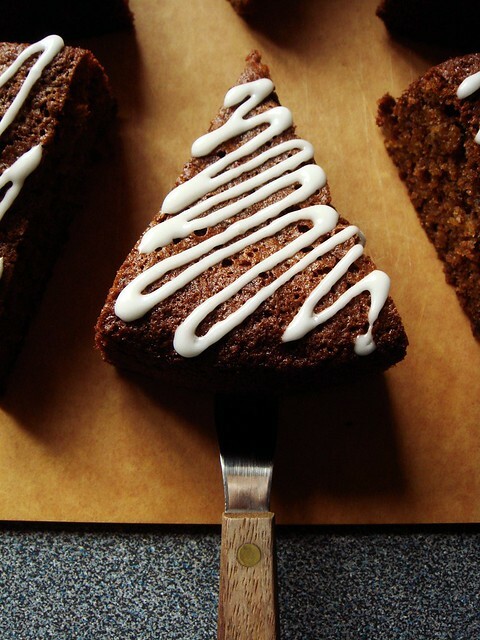 With less than a month until Christmas, now it’s the time to bake all kinds of sweet and spicy treats. Gingerbread? Yes! Speculoos? Yes! Pain d’Epice? Yes! Darkest of dark Christmas fruit cake? Yes! Plum pudding set aflame with brandy? Yes, yes, yes! Granted, some treats are more suitable for the big day and sneaking a bite any earlier seems like cheating. Anticipation is a key ingredient after all. To settle a weekday craving for something sweet and spicy, a girl needs to have simple everyday recipes too. Thankfully my new copy of Dan Lepard’s Short & Sweet took care of that. I’ve been a fan of Lepard’s How To Bake column in The Guardian. Every Saturday I look forward to begin my morning with a big mug of tea and his weekly recipe. Short & Sweet is a collection of years worth of his recipes and sage baking advices. The book has an obvious British slant from ingredients, choice of recipes, to tone of voice. Being anglophile that I am, that just makes the book more endearing. What I love most though is the creativity. Case in point, Ginger Root Cake from the cake chapter (online version available at The Globe & Mail). 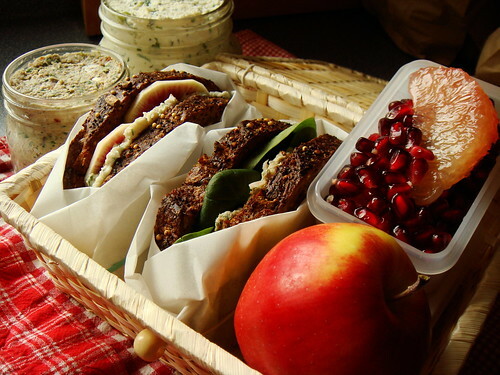 It’s no secret that I love bento and picnic makes me go weak in the knees with excitement. So it shouldn’t be a surprise to you that I chose to make a sandwich bento for this week’s French Fridays with Dorie since it’s Cook’s Choice Week! Not just one, but two recipes from Dorie Greenspan’s Around My French Table! There isn’t one single mention of bento in the book so how did this came about? Bento inspiration is everywhere, my friend. You just need a bit of imagination. The appetizer chapter contains many quick and easy recipes. Wherever I see spreads or dips, visions of sandwiches fill my mind. The recipes for Sardine Rillettes and Lyonnaise Garlic & Herb Cheese (aka Boursin’s Mama) caught my eyes early on. One is rustic and the other creamy. Both have distinctive and strong flavours yet easy to make with common ingredients in the kitchen. Sold! My bento consists of two sandwiches made with hearty Seeduction bread from Whole Foods. One is filled with Sardine Rillettes and baby spinach, the other with homemade Boursin and thin slices of watermelon radishes. I pair them with a light dessert of ruby grapefruit pomegranate fruit salad and a small Ambrosia apple. Who wants to come picnic with me? I grew up dining at the kids table in all my family gatherings. With more than half dozen cousins of similar age, we certainly had the number to warrant our own little table. What I remember most is the kid-friendly dishes our parents would order for us. While the grown-ups dined on typical Cantonese banquet dishes, we dug in to grouper fillets braised in cream of corn or steamed tofu filled with minced shrimp. You know, dishes that are not heavily spiced and carry low risk of choking hazards. 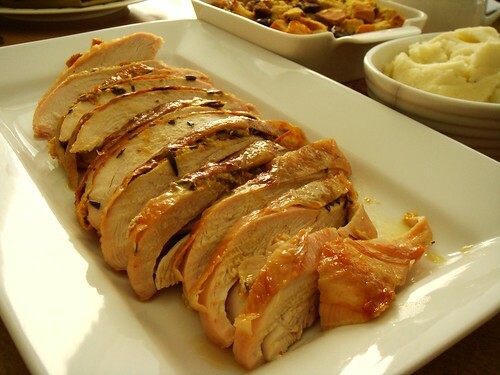 Thanksgiving is a family-centric holiday with strong emphasis on home cooking. I can imagine hosting the kiddos at their own table makes lots of sense for large families. However, with already so many things to cook, preparing additional kid-friendly dishes is too much to ask for. That doesn’t mean we can’t have some fun though by serving the food in an unexpected way. Behold my Thanksgiving Turkey “Sundae”! 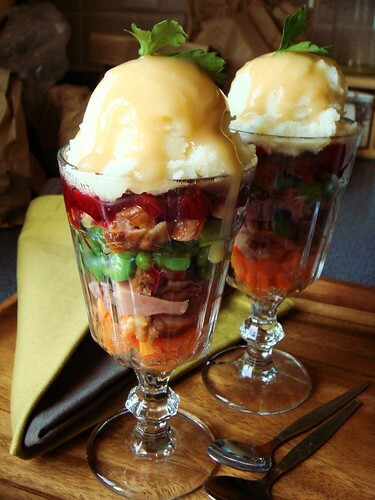 This sundae has layers of your traditional dishes including carrots, chopped turkey, peas, and cranberry sauce. The tromp l’oeil is achieved by the all-important scoop of mash potato and generous drizzle of gravy. 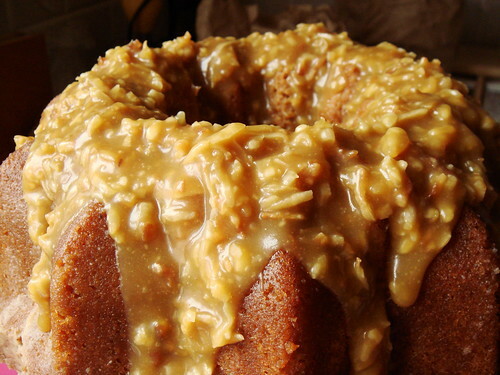 This post marks the 1000th entry I wrote on Dessert By Candy since this blog started in 2005. I took time recently to read some of my older writings and it brought up all kinds of emotions. There were fun moments like my annual holiday baking and homemade gifts. There were memories of triumph when I mastered new cooking and baking skills or hosted great parties. There were flashes of silliness like the time I created a fantasy in-flight meal or the cake that waves back at you. I experienced challenges and growth, some more difficult to overcome than others. I went through phases which I could not look past my own navel and generally not too pleasant to be around. I also let this blog collect dust for long stretches of time simply because I lost the motivation to write about things that make me smile. Only since the last 12 months have I find a new focus of what Dessert By Candy is all about. Writing used to be my least favourite activity. I would stare at a blank page for hours yet nothing came out of my twirling pen. But of course everyone’s been right all along. This is a skill that takes practice. The more I write, the easier it became to put my thoughts in words. Nowadays, I have more things to write about than time and energy allow. I discover interesting stories from the mundane daily life and have something to say about them. I feel like I’ve been time-traveling to the future in the last week. While the excitement of Thanksgiving is building steadily in much of the blogosphere, I already moved on to making creative dishes out of leftovers from my (non-Thanksgiving-related) turkey feast. I love my stuffing enough to eat it directly out of the fridge (don’t judge) but the slices of roast turkey needed help. Since I had some leftover stale bread, lots of extra herbs, and crimini mushrooms, I came up with making a brunch spread with the star being Turkey Mushroom Strata. What is a strata? 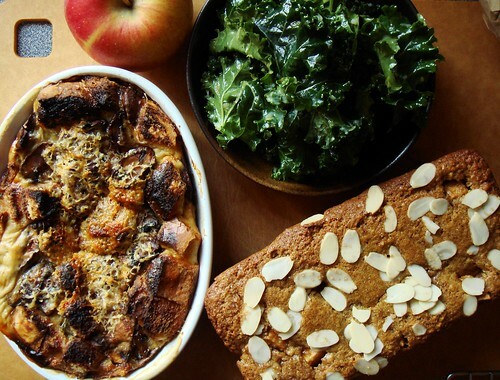 Long story short, it’s a savoury bread pudding. It is the final resting place welcoming home to odds and ends in the fridge that embraces the motto sum is greater than its parts. Best of all, it is a very forgiving dish to make with much wiggling room for improvisation based on ingredients you have on hand. I did not follow any recipes for mine but Martha Stewart has a collection of frittata and strata recipes that look great. My post-Thanksgiving strata was hearty with plenty of chopped roast turkey with caramelized onion and mushrooms, but barely any stale bread. The generous layer of mixed herbs including sage, parsley, and summer savory gave it a fresh taste. The custard of eggs, lots of egg whites, and milk was seasoned with paprika, nutmeg, and Dijon mustard. A snowy blanket of grated parmesan cheese finished it with crispy brown crust. Braised Cardamom-Curry Lamb is a dish that’s not meant to be this week. First, it received the substitution treatment. Then I ran out of cooking time. Next I switched to a different cooking method. Finally I returned to it hours later with some surprising results. Is it still a dish I am proud to serve? I will let the photo do the talking. 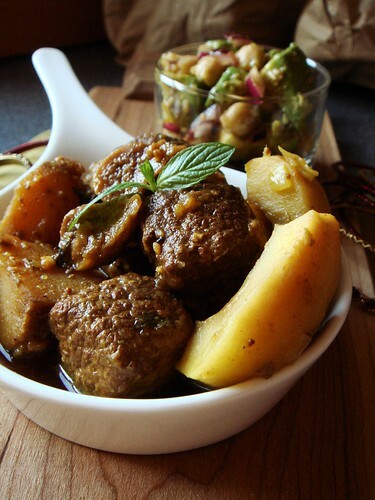 What I have here is a slow cooked veal stew in cardamom curry, sweetened with russet apples, figs, mint, and honey. The chunks of new Yukon Gold potato absorbed all the complex flavours and are true delights. There is not a hint of spicy heat in this curry. The ingredients truly reflect its multicultural influences including Indian, Moroccan, and a bit of French. The use of veal undoubtedly nudged the dish more to its European roots but I’m okay with it. I served it with an equally multicultural avocado chickpea salad in a ginger cardamom vinaigrette. The vinaigrette burst with tastes of freshly squeezed lemon juice, minced ginger, cardamom, cumin, and smoked paprika. The creamy yet bright salad was a good partner to the rich warming veal stew. Last Saturday I hosted a roast turkey supper with all the trimmings. The timing was strange as it was neither Thanksgiving in Canada or our southern neighbour. What gives? I missed out on Thanksgiving this year back in October because I was in Georgia for my last race of the season. Although my family does not place much significance on the holiday, I do miss the traditional holiday dishes. With just over 10 days until American Thanksgiving, the online world is abuzz with turkey talk. Every article I read only made my craving even stronger. Coincidentally, I already invited Dad to come over for lunch so the decision to cook up a storm with all kinds of seasonal favourites seemed rather obvious. With only three of us, roasting a whole turkey would be overkill. Instead, I opted to roast a split breast and a thigh for a choice of white and dark meat. The amount was just right with plenty of leftovers. Following the directions in The Cook’s Illustrated Cookbook, my Orange & Rosemary Turkey was juicy, tender, and infused with citrus herbal taste. If presenting a whole bird is not a priority, I heartily recommend roasting turkey parts. Brining the turkey was trivial since each part fit neatly into a large resealable freezer bag and I could fit them into separate empty spaces in the fridge. As for roasting? It took merely 90 minutes! Both the breast and thigh cooked to perfect doneness at the same time. And carving was so incredibly easy!